In days gone by, a trip to York meant only one thing: tea at Betty’s. Now, with my vegan sensibilities, I’ve given up Betty’s in favour of a meat-free little cafe just off the Shambles: Goji. York is a wonderful, ancient little city with a network of narrow streets of largely independent shops and eateries, so it shouldn’t be surprising to find somewhere amazing nestled in there. Now every time I sail past the queue at Betty’s and straight into the warmth at Goji, I can’t help feeling a little smug. I’ve eaten at Goji probably four or five times in the last year, and I just love it. I’ve had the Sunday roast twice, and it’s easily my favourite thing on the menu (not including the cakes, obviously). The roast itself is chock-full of lentils and nuts. Nut roast has an unfair reputation as being a bit bland and sawdust-like, but I’ve never really found that to be the case, there’s always so much flavour. You get a really generous portion and a lovely mushroomy sauce surrounding it with those wonderful earthy flavours. The accompaniments are also pretty special: plain green beans don’t add much to it, but the cabbage and roasted carrots and parsnips are good, and it’s rare to get quite so many roasties, I find, so I’m happy with that. And behold, at the front of the picture, a vegan Yorkshire pudding! Whenever I see one on a menu, I devour it. True, it doesn’t look like a Yorkshire pudding – but inside it’s just the same and is a very welcome addition. Goji also has an impressive cake selection in the window, luring in the passers by (it’s always busy in there, and does good take-out business too, with an enticing deli counter of samosas, salads, etc). The lemon and poppyseed cake is good, and I’ve had the chocolate hazelnut bundt cake before. 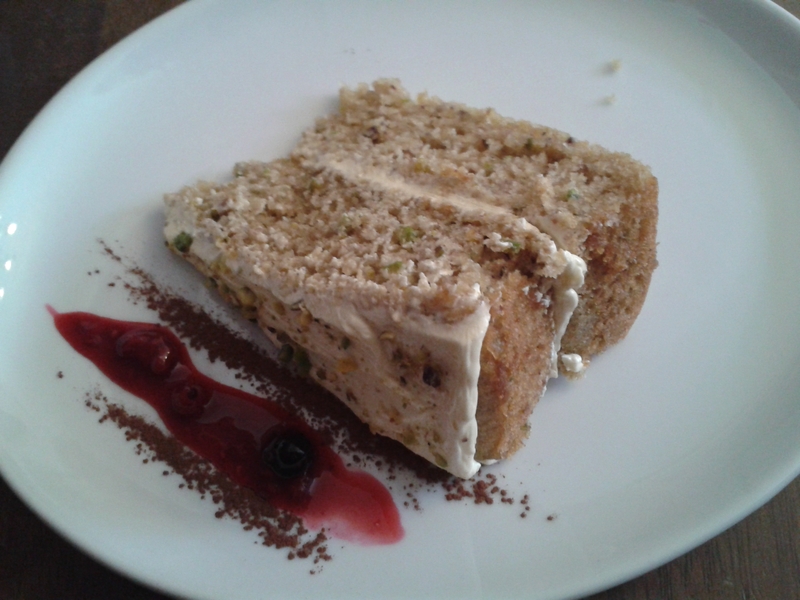 This time I tried something completely new: the rose pistachio cake. The texture was just spectacular, it was a lovely moist sponge, with really subtle flavours (you have to be careful with rose, after all), and good creamy icing. A definite winner! Goji also has vegan cream and ice cream at the ready too, and a vegan sticky toffee pudding on the menu which I am, astonishingly enough, yet to try. For anyone else who shares my old ‘York=Betty’s’ mentality, I urge you to cast your net a little wider. Next time you go to York, take a detour away from the crowds at Betty’s and opt instead for this tasty and cosy little place! 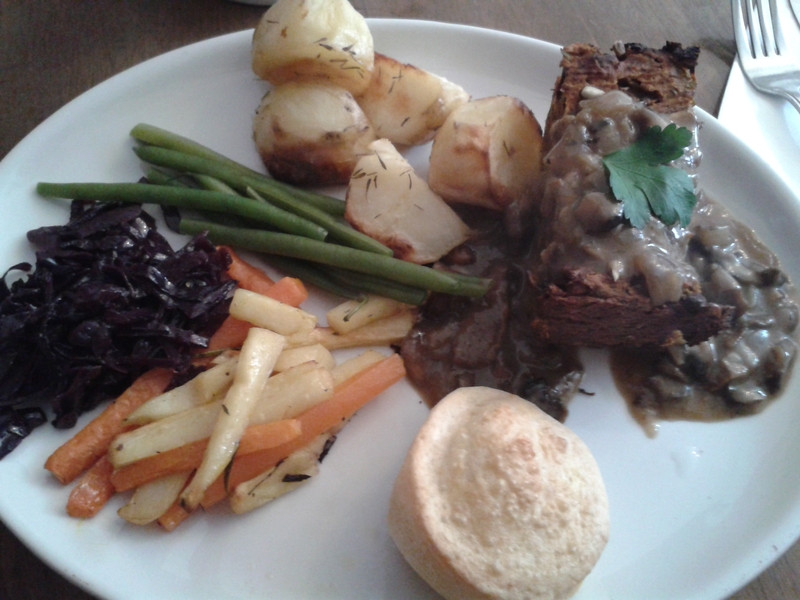 This entry was posted in Travel and tagged Goji York, vegan in York. Bookmark the permalink.